Fibre Glast Glitterflakes are .015" metallized polyesters flakes typically used with a clear gel coat. 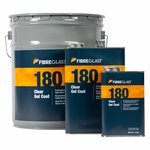 We recommend our #180 Clear Gel Coat which is an ISO/NPG marine gel coat with excellent weathering properties and a high gloss suitable for glitterflake. Typically, glitterflake is used in molding applications. 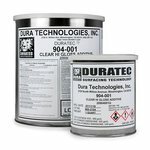 It is necessary to first apply 12 – 14 mils of wet catalyzed gel coat. It is important to catalyze this cover layer at the recommended levels as over or undercatalyzation can cause various problems including premature yellowing, cracking and a reduced gloss. We recommend that this cover coat be allowed to tack up before proceeding. The glitterflake coat should be applied directly behind the cover coat. Normally, glitterflake is added at 10% by weight , but this may be increased to up to 20%. In excess of 20% can cause curing problems including a distortion or ripple in the surface. Also, mixing the glitterflake with the gel coat should not be done more than one hour before it is to be applied. Catalylze the glitterflake gel coat at the recommended level and apply a wet layer of up to 10-20 mils. The glitterflake layer will not provide a total hide and some visible changes in the orientation of the flakes will be present. We recommend using a pigmented layer directly behind the glitterflake layer which will hide the reinforcement and offer an improved final appearance. Typically, a contrasting pigment color is used such as black with silver or gold or white with red or blue. Often, this pigmented layer is a reinforced gel coat layer, as there are already about 25 mils of gel coat on the mold and a reinforced layer will help avoid problems as well as offer added strength. 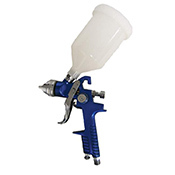 Conventional gel coat spray equipment is typically used. The glitterflake tends to clog so experimentation with larger nozzles may be necessary. Also, problems can occur if there are "hot spots" or over catalyzed areas in the gel coat. This can be a particular problem in equipment which does not provide even catalyst disbursement. Hot spots tend to blister and will show significant color change. Glitterflake is difficult to repair. It comes in a wide variety of sizes and colors and many types will turn bright silver if they are directly sanded. Consequently, minor surface repairs should be done only on the clear, careful to avoid the flake. In the event that no first clear exists, a clear patch must be applied. Rough the entire surface to be repaired. Complete any glass repairs, and allow to fully cure before proceeding with the glitterflake repair. Feather sand the repair area and wash with #9 Acetone or other solvent and allow to completely dry before proceeding. Mask off a large area around the repair. Apply a back up layer of catalyzed pigmented gel coat or resin and allow to dry. Next, mix the desired amount of Glitterflake and clear gel coat and catalyze. Apply a layer 12-20 mils thick and cover with peel ply, wax paper or cellophane. Smooth the area and allow to dry before removing the cover. Overspray with clear gel coat 12-14 mils thick. The addition of #71 Styrene Wax will insure a tack free finish. Allow to completely cure and then buff. If additional gloss is needed, wet sand with 600 grit sandpaper and polish to luster with boat polish. Scratches can be repaired by wet sanding with a 600 grit sandpaper and then polishing back to luster with a boat polish. If no clear layer is present, it is necessary to apply a clear spray so you have an area to feather into. We recommend adding #71 Styrene Wax to the gel coat before catalyzing. Spray the catalyzed gel coat and allow to cure completely, usually 24 hours. Use 600 grit sandpaper and scuff an area larger than the repair. Be careful not to sand too hard and damage the glitterflake. Wash with #9 Acetone or other solvent. Continue as outlined above, applying a pigmented layer, a glitterflake layer which must be smoothed and a final clear overspray. It is possible to use a brush on small repairs, but we recommend spraying gel coat whenever possible. Sparkling Silver This glitterflake will help catch the light with a silvery hue. Check the store page for exact coloring, detailed product information and pricing. Glittering Gold This glitterflake is perfect for giving your part a great golden finish. Check the store page for exact coloring, detailed product information and pricing. 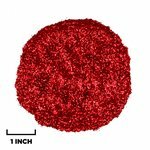 Radiant Red Show off a metallic red edge with this popular glitterflake. Check the store page for exact coloring, detailed product information and pricing. 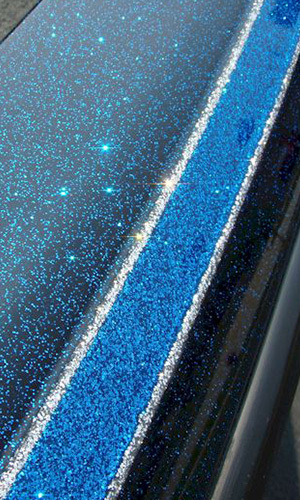 Brilliant Blue A perfect way to add a blue metal finish, this glitterflake is perfect for any part. Check the store page for exact coloring, detailed product information and pricing. 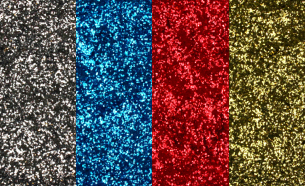 Although glitterflake poses no unique hazards in itself, it is wise to work in a well ventilated area whenever working with gel coats or use adequate respiratory protection. Glitterflake is easily suspended in air however, and you may find that it travels easily and will find its way to unwanted areas if you are not careful. We have found that paper mixing and measuring tools work better than plastic or metal for this reason.